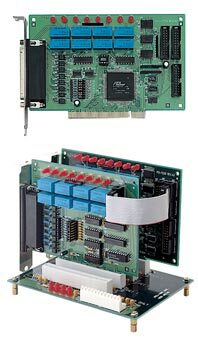 ADLINK's PCI-7250/7251 provide 4-CH SPDT (Form C) & 4-CH SPST (Form A) relay outputs and 8-CH isolated digital inputs. The status of each relay output is represented by an onboard LED. When the relay is in SET condition, its corresponding LED will turn ON, and on the contrary, it is OFF. All digital input channels are nonpolarity, optically isolated, and may be set to use RC filter or not. The devices are suitable for collecting digital inputs in noisy environments. 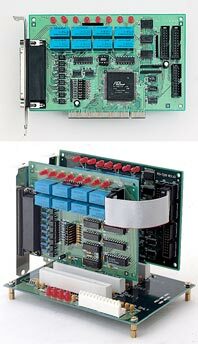 The PCI-7251 is an 8-CH relay outputs and 8-CH isolated DI extension card of the PCI-7250. All the I/O functions of PCI-7251 are the same as those of the PCI-7250. The PCI-7251 has to be connected with PCI-7250 and the bus interface is controlled by the PCI-7250. Up to three PCI-7251 cards can be connected to one PCI-7250, therefore, expanding the PCI-7250's DIO from 8 DIO to maximum 32 DIO.